Grounded in both theory and practice, with implications for both, this book is about children’s perspectives on the borders that society erects, and their actual, symbolic, ideational and metaphorical movement across those borders. Based on extensive ethnographic data on children of immigrants (mostly from Mexico, Central America and the Philippines) as they interact with undergraduate students from diverse linguistic, cultural and racial/ethnic backgrounds in the context of an urban play-based after-school program, it probes how children navigate a multilingual space that involves playing with language and literacy in a variety of forms. Immigrant Children in Transcultural Spaces speaks to critical social issues and debates about education, immigration, multilingualism and multiculturalism in an historical moment in which borders are being built up, torn down, debated and recreated, in both real and symbolic terms; raises questions about the values that drive educational practice and decision-making; and suggests alternatives to the status quo. 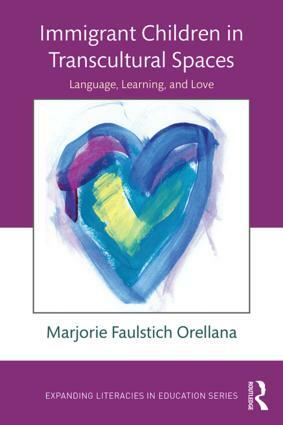 At its heart, it is a book about how love can serve as a driving force to connect people with each other across all kinds of borders, and to motivate children to engage powerfully with learning and life. Marjorie Faulstich Orellana is Professor of Education, Urban Schooling Division, University of California Los Angeles, USA.